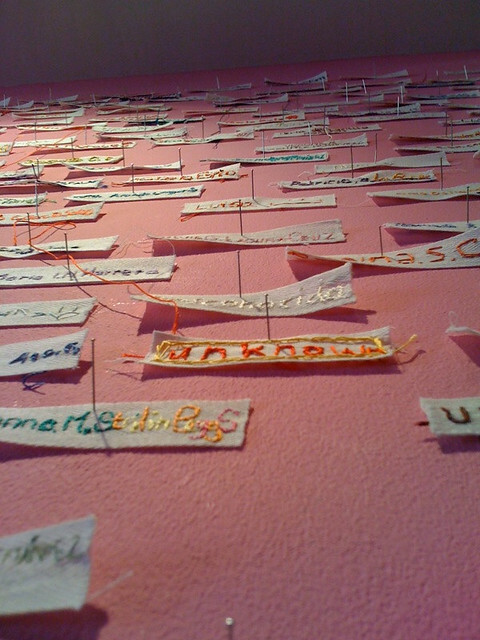 Almost exactly six months ago I blogged about an art project I had taken part in called Desconocida Unknown Ukjent, which I had discovered through the fabulous Craftivist Collective. Pallant Gallery were also kind enough to send me two labels to embroider at home. Desconocida Unknown Ukjent is an international art project by the Norwegian artist Lise Bjorne Linnert to raise awareness of the murder, trafficking and abuse of women in Ciudad Juarez, on the Mexican/ US border. 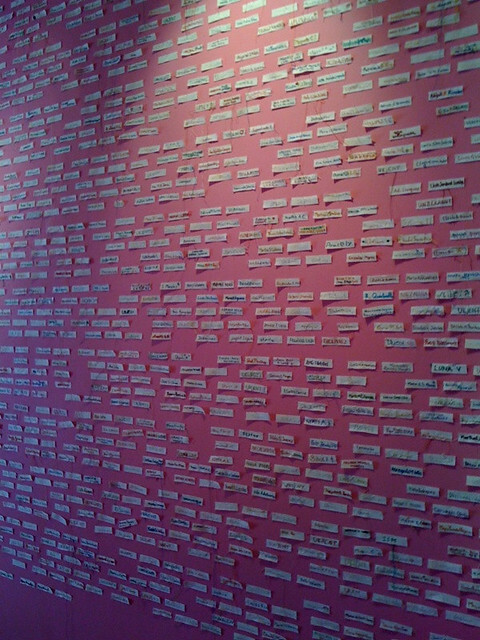 Since 1993, between 500 to possibly over 1000 women are believed to have been murdered in the city or have disappeared. 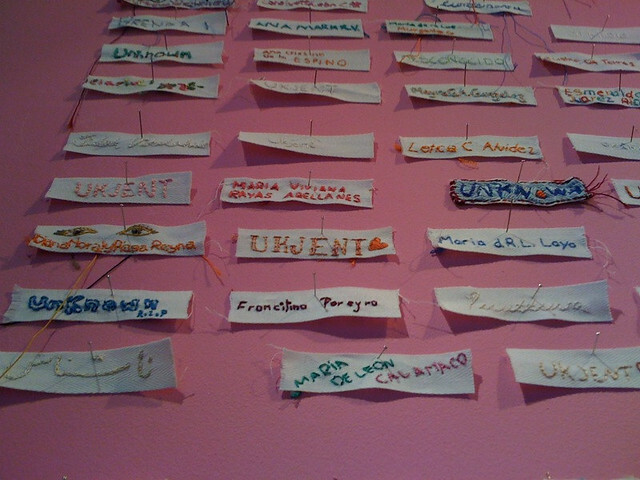 In this art project, each participant embroiders the name of one of the dead or missing women of Ciudad Juarez and also embroiders the word ‘unknown’ to remember all the unidentified victims of similar crimes worldwide, taking the time used to embroider the name or words to remember these people. The Aussie and I were on the South Coast this week and were able to go to Chichester to visit the Pallant Gallery and see Lise’s complete work. When embroidering the individual labels it was difficult to even imagine how they would all look all together. The labels have been displayed to spell out the lyrics of the Mexican and the USA national anthems in Morse Code, which is why there are gaps between some of them. It is difficult to describe the emotions of what it was like to see them all together. Embroidering the single label was very moving because you knew that person had faced hardships we don’t even have to consider in the UK. 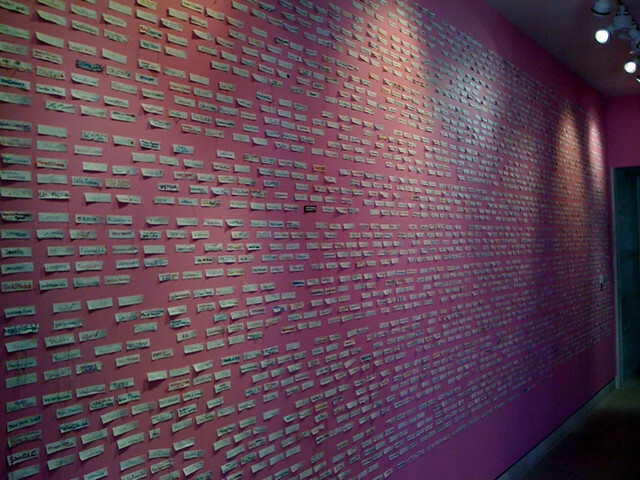 But when I saw the whole wall of the labels, remembering that every single one of them represents someone that is dead or missing and that the authorities have so far done nothing to investigate a single one. I find it very difficult to put in to words the combined feeling of utter sadness and anger at the injustice. Please have a look at Lise Bjorne Linnert’s blog to find out more about the project.